Not everything healthy has to taste bland. I have discovered a few treats I incorporate into my daily meals that are equally as delicious as they are healthy and filling. I shop at Trader Joe’s regularly but if you don’t have one near by you can find equivalents at other stores but I can’t guarantee the same yumminess. I literally eat this snack everyday and so far I have not gotten tired of it. It’s one of my favorite small meals ever! 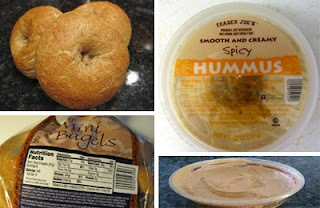 All you have to do is toast the bagels and dip them in some spicy hummus and you’re in for a delicious treat! Be sure to blend in the spices in the middle of the hummus to get the full effect. Whole wheat bagels have lots of fiber and as a complex carb will keep you full longer. 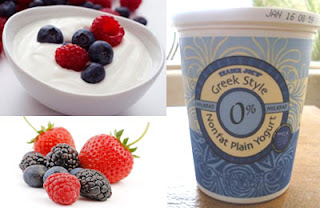 With roughly the same amount of calories as regular low fat yogurt, this delicious and nutritious Mediterranean yogurt offers double the protein and almost half the amount of sugar. Plus who doesn’t need more calcium in their diet? Add some strawberries, blue berries and raspberries and you’ve got yourself a healthy and nutritious snack. Instead of chomping down on a bag of chips when that 3 o’clock hunger hits, grab a handful of these raw almonds and you’ll be surprised how delicious and filling they are. 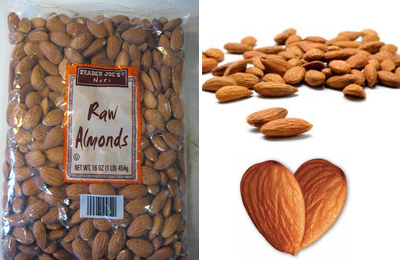 Almonds are a great source of mono-saturated, also known as healthy fats, and are rich in Vitamins B and E.
Enjoy and remember to never shop hungry! Call me skinny knowing snacking healthy keeps you looking FIT 'n FAB. What else is FIT 'n FAB? These super cute clutches @ 25% off : I want a cute clutch! !